Plain old diary? Not anymore! Add colour with pens, tape and more! My love of paper may make me a little bit biased, but I believe that a good old paper diary could be the key to improving our lives little by little. There seems to be a large number of diaries on the market today, ranging from the highly-decorated and specific to a type of lifestyle, to a bog-standard day planner from the supermarket, in black and white. Along with the bells and whistles comes a hefty price tag. But is there a diary somewhere in the middle? One that works for exactly your life? One that changes when your life does? It’s been said that if you want something done right, do it yourself. In the case of a diary, this could not be more apt. When you are keeping a diary, it needs to be something you look forward to each day. For many people, this means it needs to be fun to look at. Customising your diary by simply using pens in cheerful colours is a great first step on this road. Consider using different colours for different categories; for example, Work, School, Home or Personal. It also needs to fit your needs, so the space in the diary needs to be quite flexible, at least at first. For this reason, I recommend getting a page-a-day diary. Depending on your needs, A4 or A5 in size. Some people use a diary both to plan their days and to track what they actually did with their time, with a view to improving these practices to live more efficiently or more healthily. Water intake, steps per day, urgent and non-urgent jobs and that all-important ‘me-time’ can be scheduled and checked, with a motivational twist. In my opinion, one is never too old for stickers! If a gold star will motivate you to take a daily walk or drink your 8 glasses a day, then go for it! Arranging your diary one month at a time will allow you to assess what you have done and whether it works for you. If it doesn’t work, change it! Add or remove things from your layout for the following month, see if it’s any better, and repeat until you’re happy with it. You can change how you do this as often as you like. Life is not set in stone, so why should your diary format be? 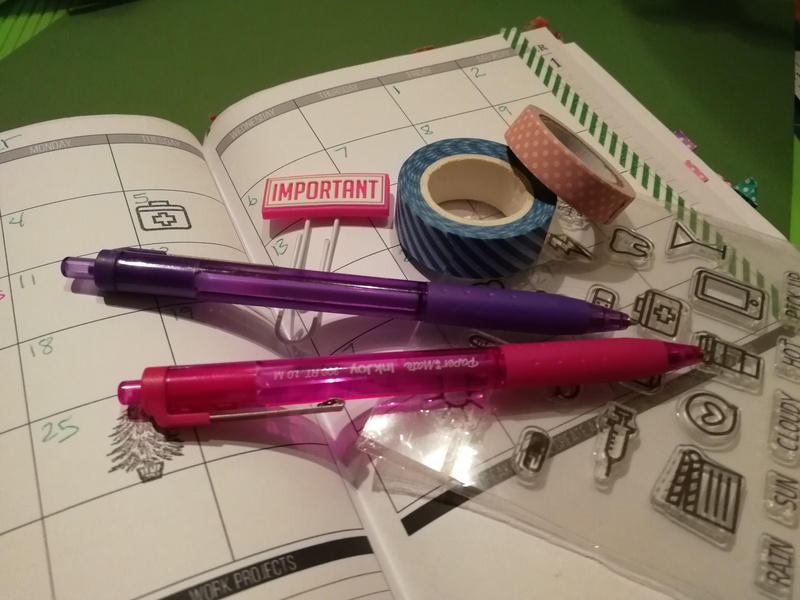 Unravel & Unwind is planning a monthly Sunday afternoon Plan With Me session, providing a selection of fun colours, stamps, sticky notes, and above all ideas on how to make your diary your own. All you will need to get started is a page-a-day diary, or even just a plain bound notebook. I am trying out Passion Planner this year. It has a monthly layout followed by a 2-page weekly spread. It has extra pages at the back, motivational quotes, monthly reflections, goal-setting help and more! Also it is so pretty! I have used this Leuchtturm1917 dot-grid notebook previously. The dot-grid pages enable you to draw quick squares or lines but it’s not so invasive that it will interfere if you wish to use the paper to draw on. The pages are numbered and there are index pages at the front so you can keep track of what you have written! There is also a pocket at the back for storing extra bits of paper you may need to keep. Here is a link for typical day-a-page ones. If I use these, I will buy a January-start one and use the pages from July onward for notes and other things, and then I will get an academic one that runs July-July and use the January onward for my notes. The dated pages means that you can still keep an index of where certain pages are! Here‘s a little look at what’s coming up this month.